Investors of Marico Ltd, popular for its Parachute coconut hair oil brand, are a happy lot. The stock has risen by about 31% from its low in mid-October. While there has been a general liking for consumer goods stocks of late, Marico has some things going for it as well. Prices of copra, a key ingredient for coconut oil, have declined by about 20% year-on-year in the December quarter, said analysts from Antique Stock Broking Ltd in a report on 19 December. Since copra accounts for about 40-50% of the company’s total raw material costs, lower prices of the commodity will reflect positively in the operating profit margins. Further, the sharp fall in crude oil prices from the October highs is also likely to support margin expansion, as some of the inputs are crude-based derivatives. “Easing of input costs and operating leverage benefits are expected to aid margins in this quarter," said the company in its pre-quarterly update for the December quarter on 3 January. For the half-year ended September 2018, consolidated Ebitda (earnings before interest, tax, depreciation and amortization) margin dropped to 16.8% from 18.2% for the same period last year. This was on account of higher oil prices. In its pre-quarterly update, the company added that the overall volume growth in the domestic business was lower than its medium-term aspiration, while its international business was on track. Of course, more details will emerge when Marico announces its December quarter results on 5 February. Even so, analysts remain gung-ho on the company’s prospects. “Crucially, at a time when both sector multiples, as well as the ability of its peers to pass on emerging material cost pressures are under question, Marico provides far higher visibility compared to peers," said analysts from Motilal Oswal Securities Ltd in a report on 3 January. 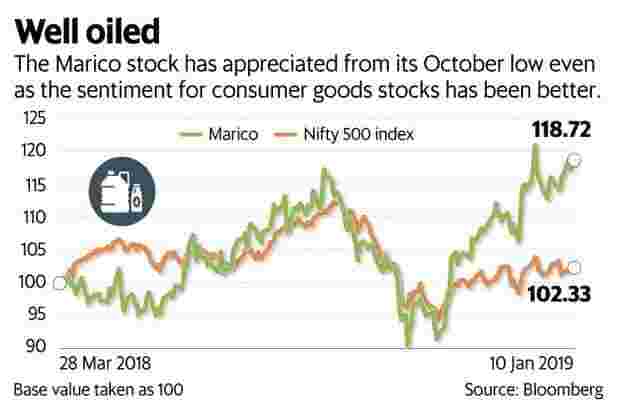 The only hitch perhaps is the rise in the Marico share price in recent months, which suggests investors are capturing a good portion of the new-found optimism. Valuations are steep at about 44 times its estimated earnings for the next fiscal year, shows Bloomberg data. The positives notwithstanding, if earnings disappoint, investors will be on a slippery slope with the hair oil maker.